Review time and attendance, modify hours, authorise shifts, see staff notes, and leave manager comments. 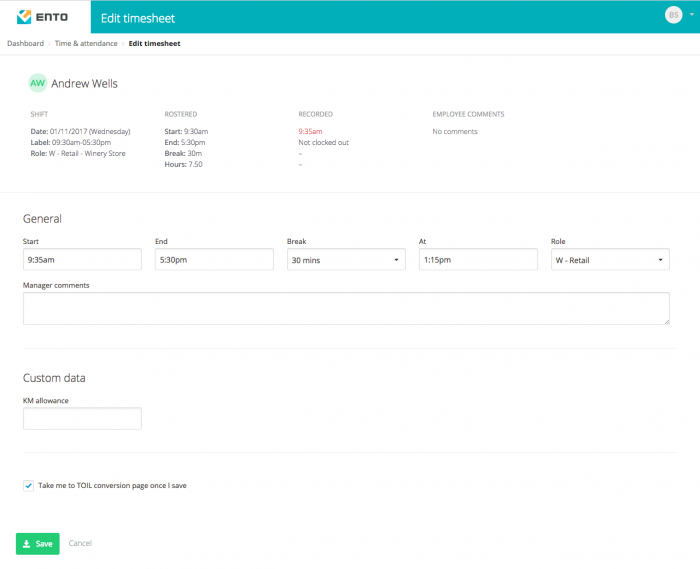 To view timesheet data go to Time and Attendance > Review timesheets, or use the Timesheet shortcut on the dashboard. The timesheet review area displays all pending timesheets by default. 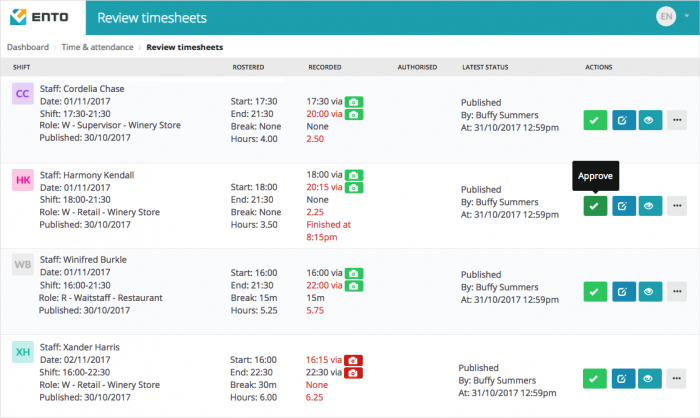 Best practice is to review and authorise timesheets as soon as possible after each shift has been worked. If staff have clocked in and out at the times aligned with their rostered times, or passed PIN or facial recognition, a green button with a tick or check mark will display. Clicking the green tick button is a quick way to authorise the recorded times that are displayed. If the staff has not recorded their start and or end time, has clocked in but not out, or to authorise times that are different than what has been recorded, you will need to edit the timesheet. Clicking on the edit icon at the right of the record will take you to the ‘edit timesheet’ screen, which will allow you to modify the shift details. You also have the ability to enter in a manager’s note, visible to you and other managers with the appropriate account access and permissions, but not visible to staff. Notes are exportable, and can be a great way of capturing supplementary information about a shift, or reasons for making a particular adjustment. Depending on how your account has been set up, you may have additional fields at the bottom of the page. Once you have made any required changes or adjustments, click Save. This will save your changes, authorise the timesheet, and redirect you back to the timesheet review screen, ready to move onto the next timesheet. In addition to PIN or facial recognition, you may be authorising timesheets using GPS for verification. You may see the GPS icon in red or green. For more on GPS clock in and out read up on staff Clocking in and out. The ‘zero out’ option is useful for quickly dealing with shifts that, for whatever reason, were not worked, and should not be processed or paid – for example, no show shifts, or shifts that were rostered by mistake. Zero-ing out a shift, will simply authorise the shift at zero hours worked. If you want a walk through of time sheet editing basics, take a look at the training video below.